The company claimed that it had not received the ICO’s letters. Take it from us, if you get a letter from the ICO or the TPS, don’t ignore them or try making up excuses. You should respond. They really don’t like being messed around. Direct Choice Home Improvements Ltd tried blaming their supplier for the TPS complaints. Again, another bad move. Your business cannot expect to pass blame to a supplier. You should always have access to TPS screening to either check your suppliers TPS screening or to undertake it yourself. Ask your supplier for a TPS Screening Certificate as proof of screening. By now, the ICO started to request copies of the correspondence between the company and the supplier. The workload will undoubtedly have begun to take its toll on the company’s resources. Between 29 April 2015 and 29 September 2015 the TPS and ICO received a total of 167 TPS complaints. The company said a third party was to blame; telling the ICO it had been assured its list of people to call was screened against the TPS register. 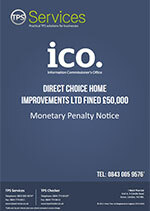 Although not the main focus of the fine, Direct Choice Home Improvements Ltd also failed to operate a proper Do not Call (DNC) list and continued to call people who had previously asked not to be called again.